We are looking for special education teachers, AEA & university personnel who would like to present at the upcoming DCDT Conference in Cedar Rapids in October, 2018. 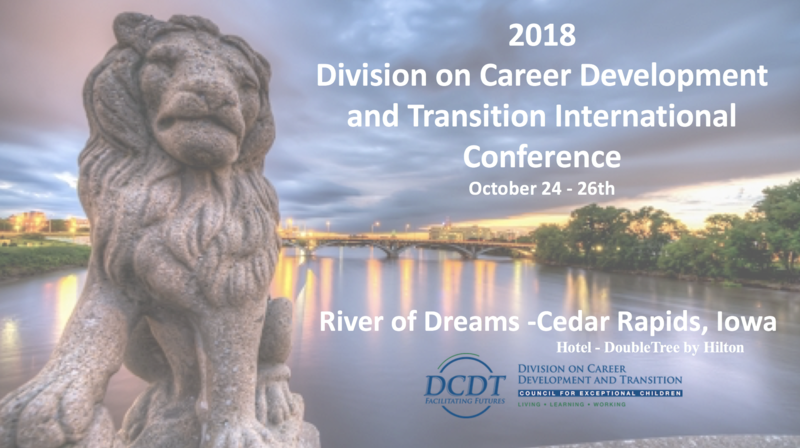 You are invited to submit a proposal to present at DCDT’s 2018 International Conference, “River of Dreams” in Cedar Rapids, Iowa! You will need to create a log-in. If you submitted a proposal last year, you will need to create a new log-in. Once the proposal is submitted, you will receive a confirmation email and a link to review your proposal for any changes before it is reviewed. Let’s show them all the great ways we are doing transition in Iowa! Presentations will focus on research of, strategies for, and personal experiences with family-school relationships. Content includes relationship-based approaches to family engagement, “The Dance of Partnership” by Janice Fialka, and the global journey of Chris Ulmer, a former special education teacher who travels the world interviewing people who are neuro-diverse in an effort to demonstrate the benefits of inclusion. Presentations will focus on the continuum of services and partnerships to enhance student preparation for post secondary employment. Content includes From High School to College: Steps to Success for Students with Disabilities featuring author Elizabeth C. Hamblet, recent legal cases presented by ISU’s Dr. Angela Prince, collaborating with partners enriches opportunities for students, WIOA opens doors, and strategies for the classroom. Presentations will focus on the use of research evidenced-based language and literacy instruction aligned to the Iowa Core Essential Elements. Content includes implementation of Core Vocabulary featuring Dr. Karen Erickson, whose research is focused on communication, literacy, and academic instruction and assessment for students with significant disabilities. Grant participants of the Significant Disabilities strand will also share their experiences and the system structures they have built to support implementation of Iowa’s Specially Designed Instruction Framework. Sessions in this strand will be geared toward teacher-leaders and administrators. Dan Rockwell, also known as the Leadership Freak will facilitate an interactive session focused on maximizing the return on your energy as a leader. He will share fresh ideas and strategies around accountability, feedback and positive culture. A few other highlights in the Leadership strand will include a 2 part “Hot Topics” legal panel featuring Thomas Mayes and Miriam Van Heukelem, a Parent/School panel talking about Chapter 103b,a Coaching Workshop and a session on “Graduation Guidance” to support IEP teams in preparing students for post-school success. Sessions will focus on high-leverage instructional practices that fuel effective and efficient classroom interaction and student outcomes for persistently struggling readers. Dr. Denise DeCoste will facilitate a panel discussion on how to use the Protocol for Accommodations in Reading (PAR/uPAR) and provide both basic and advanced sessions on The DeCoste Writing Protocol. Other featured sessions include those by Linda Farrell (author and teacher, Readsters) and Wendy Robinson (Heartland Director of Instructional Services, SLP, dyslexia expert). The Early Childhood strand will include national experts Dr. Rosemarie Allen, Dr. Kristie Pretti-Frontczak, Larry Edelman, Mollie Romano, and Kat Cripe. Topics will include using technology in Early Intervention, Preschool Suspension and Expulsion, Torsh Talent, Family Guided Routines Based Intervention, and assessment in early childhood. Additionally, come learn from Iowa teachers about their experiences implementing the LEAP preschool model for children with ASD as well as hearing from participants in our work on high-quality Specially Designed Instruction through implementation of the DEC Recommended Practices. The Behavior strand will address interventions when students exhibit problematic behaviors that interfere with their learning and/or social relationships. Several sessions will include interventions for students diagnosed with mental illness (e.g., Anxiety, Depression) who display problematic behaviors by accounting for the function of behavior and providing skill development based in various therapies (i.e., Dialectical Behavior Therapy, Cognitive Behavior Therapy, Mindfulness practices, and Acceptance and Commitment Therapy). Michigan’s Peer to Peer program will be introduced in sessions as a method to improve outcomes for students with autism spectrum disorder (ASD), students who are at-risk, and students having academic and behavior concerns. Although the Peer to Peer program was designed for students with ASD to improve their engagement in the school community and to teach social and problem solving skills, outcomes were identified for students who served as the LINKS for the student with ASD to the school community. Specifically, decreased behavioral referrals, improved grades, and improved attendance were seen by students who were identified as at-risk and having academic and behavioral concerns. The price is right… there is NO REGISTRATION FEE to attend, but you must fill out the registration form above to reserve your spot! Hope to see you there!